I was born and raised in Bavaria, Germany and emigrated to the United States in 1963. For 26 years, I lived and worked in the Greater Washington DC, metropolitan area as an independent stone and brick contractor. Woodturning at that time was far from my mind, although I served a three-year woodturning apprenticeship in Germany and worked as a journeyman woodturner for three years, but really could not make a living at that trade at that time. However, I always had a passion for working with wood, and upon retiring and moving to Arizona in 1989, bought a wood lathe and started turning. I really got inspired after I attended a woodturning symposium in Provo, Utah, where I met my idol, Ray Allen. I was really inspired by his work, and began turning segmented bowls and vessels. 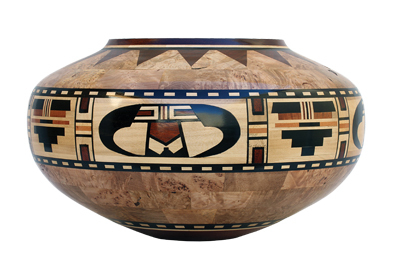 A lot of my inspiration comes from Native American pottery, and I have learned to translate some of these designs to wood. My 'Mystic Buffalo Bowl' evolved in bits and pieces. I had seen a painting by a Native American artist, and was so intrigued by it that I decided to try and translate it into wood, and so the process began. I always make a drawing of the shape of the bowl before I start cutting the wood. Most of my cutting is done with a tablesaw and the buffalo horns and face are cut with my bandsaw. I use two faceplates with dummy blocks and start gluing my rings for top and bottom at the same time. By using maple Acer campestre) burl for the main body of the bowl, I don't have to watch the grain orientation. Grain orientation is extremely important when not using burl wood. Gluing ring by ring on the dummy blocks, I work my way toward the feature ring. The feature ring is made up of lemonwood (Calycophyllum candidissimum), ebony (Diospyros spp. ), bloodwood (Pterocarpus angolensis) and pink ivory (Berchemia zeyheri). With the feature ring glued in place, I rough turn the outside of both sections to the desired shape. I then finish turning the inside with a bowl gouge, sand it, and glue both sections together. My next step is to shear cut the outside to the final shape. To finish the bowl, I sand with 150, 220 and 320 grit, then apply one coat of sanding sealer, cut back and apply three coats of Danish oil.